When you’re home all day, you need more food around. When your kids are hitting growth spurts, extra fuel will help keep school calmer. “Have a snack,” is a magic phrase for making the school day better for a kid who is having a tough time. An extra stash of chocolate can be a lifesaver for you on a frustrating day too! Perhaps you don’t need a literal trampoline (though, honestly, I love that we have a small rebounder! ), but you do need a place for kids to work out physical energy, whether it’s your yard, a corner park, a treadmill, or somewhere else. Even if you get your kids outside with activities like a sport or on nature hikes, having a place where kids can have a physical outlet in the house or just outside is really important, even for older kids and teens. Even for kids who can usually sit still and pay close attention, having a stash of things to fidget with can be a boon for a lot of families. Puzzles, clay, fidget cubes, or even just lots of rubber bands and craft sticks can be useful for kids as they read, do math, or listen to lessons. Strewing is an idea that you leave out good books, games, and other learning materials in the hope that kids find them. Don’t make everything about the curriculum you choose or the school plans you make. Find good books and other fun resources to have around that aren’t things you’re planning to assign. Your kids will be in the house more, so having more resources around makes sense. Plus having a funny read aloud to fall back on when you’re struggling or a good game to pull out on a rough day can be a good way to get over the hump, even for older students. Homeschooling can be lonely. Make sure you have a good shoulder to cry on when the days are bad, a good sounding board to help you talk through ideas, and a good cheerleader to help you push through and celebrate your successes. Having a friend who is also in the trenches with homeschooling can be good too because they’ll get it. It’s especially nice to hear about someone else’s kids so that you can see what’s normal for different ages. We’re not teachers with a classroom filled with children so that we can see the outliers. That’s good in some ways, but bad when we’re worried that some behavior isn’t normal. Sharing our struggles with trusted friends can help. Most people will find distractions during the homeschool day. That’s normal. Learn to say no to friends and family who don’t seem to realize that homeschooling is work and takes up your time. In most communities, you’ll also encounter more homeschool activities than you can possibly commit to. Learn to pick and choose to find the ones that are right for you. School days usually have less complicated schedules than homeschool days. When they say no day is the same in homeschooling, they mean it. Make sure you have a good way to keep track of your life, whether it’s an online calendar like Google or Cozi, a really good giant wall calendar like the one sold by Flylady, or a great paper planner or bullet journal that you keep on hand. This is more important as your child gets older, but it’s good practice to keep some kind of records of what you’re up to at all ages. It doesn’t have to be detailed and day by day. It could involve tracking the hours you spend, the field trips you take, the books you read, or other things. You might plan to keep samples of work, or just start the semester with a curriculum plan. There’s no one right way to do this. Homeschooling is still a paper generating business. Kids draw or write. They fill up notebooks or workbooks. They print out things they wrote. They have things they’re finished with and things they’re still working on. You want to give feedback about some things. If you don’t have a way to organize it and a plan to periodically dump what you don’t need, it can get messy and overwhelming. There’s no one right way to do it, but having a system, like in and out boxes or a special clean up day, is a necessity in most homeschools. We’re often focused on getting school ready for the students, but it’s a big change in our lives to start homeschooling. If you’re planning to work and homeschool, you definitely need time for you. If you’re going to be home with your kids all day, you need outlets of your own. A happy, and fulfilled homeschool parent makes for a better homeschool. Figure out how to build this into your weeks. PS – Don’t Miss The Prequel! 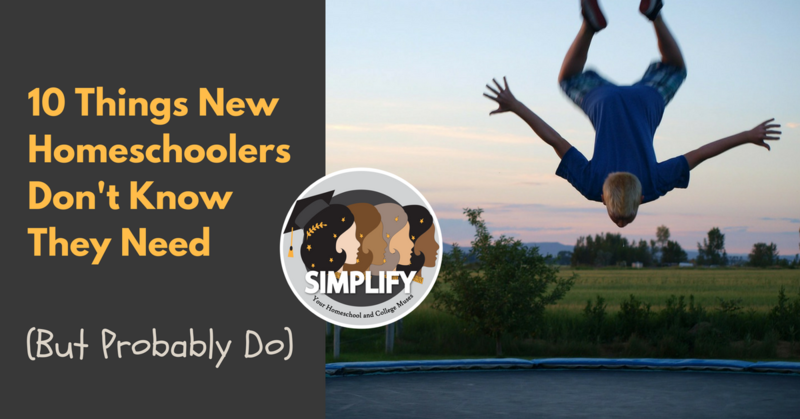 Ten Things New Homeschoolers Think They Need (But Probably Don’t). Previous StoryYes, Homeschoolers Can Teach APs at Home!